To perform the plank on the ball in standing, stand in front of the ball and place your hands on the ball about shoulder width apart. Legs should be straight and feet shoulder width apart. You should form a straight line from your head to your feet. Keep your abdominals engaged and back and neck in neutral position. Pull your shoulder blades down and back. Position is held by pectoral muscles, triceps, rotator cuff, core muscles, etc. Start slowly and be sure to maintain correct form at all times. If you feel your back sag, stop. If you experience any shoulder pain, stop. 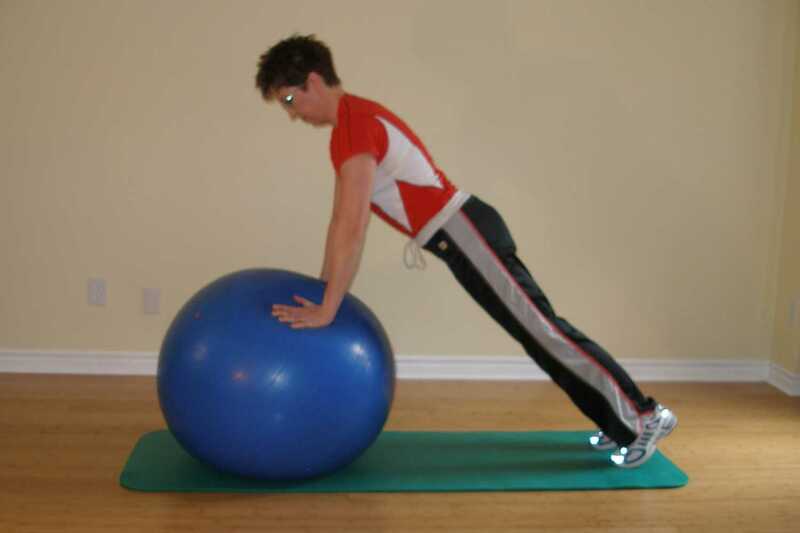 This exercise ball exercise facilitates rotator cuff activity, shoulder stability as well as trunk stability. If this is too difficult, try Plank on the Ball on Knees, or propping the ball into a corner. Remember that neck stability is equally as important as lumbar stability. Keep your chin down and neck straight. Add air to your ball. A firmer exercise ball makes for an even less stable surface. Using a smaller ball shifts your weight forward forcing your shoulders to work harder. Try Push Ups on Ball. This is a good intermediate exercise for those people able to maintain a plank on the floor and want to introduce an unstable surface. Before attempting this you should be able to maintain stability in a floor plank for at least 30 seconds before reaching technical failure. Try this ball exercise for 10 seconds. Try this for 30 seconds. Try this for 60 seconds.